On May 27 at approximately 10:00 p.m., Calcasieu Parish Sheriff’s Office deputies conducted a traffic stop on a car for a traffic violation near the intersection of E. Broad Street and Jones Street in Lake Charles. When the deputies spoke with the driver, Kevin W. Bordelon, 45, 1102 Frontage Road, #510, Iowa, they detected an odor of alcohol emitting from his breath as well as his on the inside of his vehicle. Deputies also observed Bordelon to have watery eyes and slurred speech. He advised deputies he had been drinking alcoholic beverages before driving. 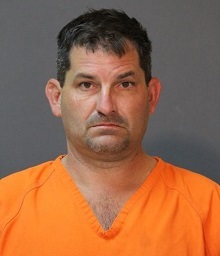 Deputies learned that Bordelon’s driver’s license was suspended for a prior DWI arrest. Bordelon gave deputies consent to search the vehicle, which revealed an open half pint of vodka and an empty pint of vodka. Bordelon advised deputies he was unable to complete a standard field sobriety test due to an injury. He then submitted to a breath intoxilyzer test which revealed he was over the legal limit. Bordelon, who has two prior DWI arrests in the last 10 years, was arrested and booked into the Calcasieu Correctional Center charged with DWI 3rd; driving under suspension for prior offenses; open container; and improper display of license plate. Judge Robert Wyatt set his bond at $16,750. CPSO Cpl. Freddy Galicia and Cpl. Christopher Sharp are the arresting deputies on this case.